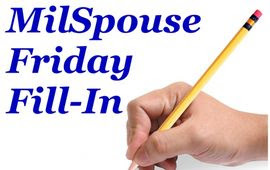 I actually have a few things on my mind to blog about but I decided to participate in the MilSpouse Friday Fill-In instead! Wife of a Sailor is starting a fun meme called MilSpouse Friday Fill-In. Every Thursday she's going to post a list of questions as a way to get to know all the mil spouses out there in the blogosphere. All you have to do is answer her questions in a blog post on Fridays and link it up on her blog. It's that easy! How did you and your spouse/significant other meet? Facebook (back when it was strictly college students). Yeah. We actually had a mutual friend "introduce" us on there so I didn't just hunt down some random hottie, but we chatted/talked on the phone for the last 2 months he was at West Point then actually started dating the day after he graduated. What is the best thing about being a MilSpouse? job security, meeting lots of different people and TRAVELING! What is the hardest thing about being a MilSpouse? missing the big moments in our friends/families lives. I hate having to RSVP no to all the weddings/graduations/birthdays! What is your favorite dish? anything new! I'm obsessed with trying new food right now! If you could change one thing in this world, what would it be? ignorance. This changes daily though depending on what is irritating me at the moment. Right now, it's stupid people. On a basic level, I just don't understand how someone who does not know whether to use which/witch or there/their/they're in a sentence has a high school diploma! On a higher level...I'm just not going to get into that today! Oops I think you have typo in your first answer....just didn't want you to not see that after your answer to #5!